So, this Affresh washer cleaner review details our experiences with it. Plus, we list its pros and cons that we found with Affresh®. We were new to high efficiency (HE) washing machines back in 2010. So we knew not that to keep their odors down, you have to clean them with a decent washer deodorizer. We moved to an apartment with a front loader HE washing machine. Then, we quickly learned how fast HE front loader washers develop mold, mildew, and other odors. Thus, this began our regular use of washing machine cleaners like Affresh® here. Our new Maytag came with a single dose of Affresh washer cleaner. That’s how we learned of products like this. Although not knowing at the time how fast these washers can start smelling bad, we put off using it. We dismissed it as a gimmick gift from Maytag, to get us to buy more. Affresh washer cleaner review. Affresh® washing machine cleaner tablets, 7 ounce box, top view. But we soon learned how essential running through the cleaning cycle once a month can be. This preserves a clean, odor free, mold free clothes washer. Top loaders as well as front loaders can develop bad odors due to mold and mildew growing around the seals. These also grow in the piping, and around the washer tub itself. Furthermore, front load washing machines seem more prone to these unclean smells. But top loaders also can smell too. If you do not leave the lid open between loads, these smells return in just days or weeks. We found Affresh® Washer Cleaner to work very well to combat that old-washer smell. The Affresh® aroma hints that the washer is definitely clean and disinfected. Perhaps some kind of floral. It’s unique. But it’s certainly more pleasant than the smell of old, soggy clothes, and less obtrusive than bleach or vinegar cleaners. 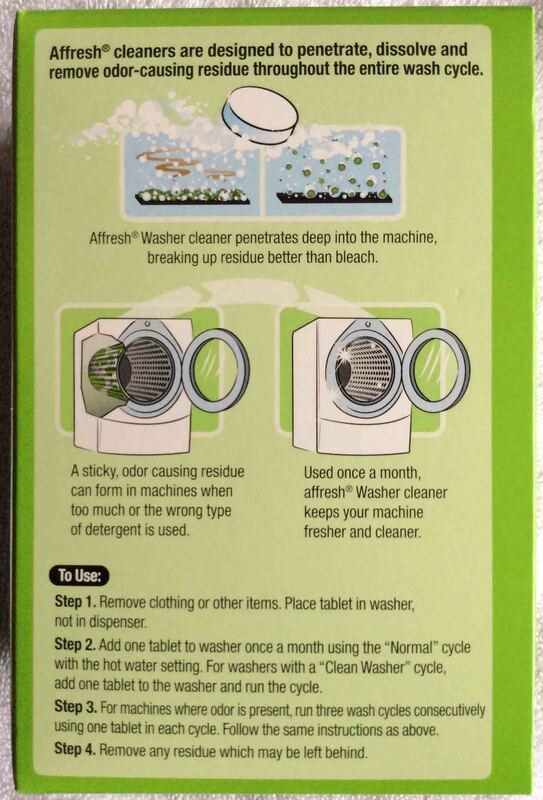 The instructions suggest running one tablet through the washer per month. Further, they say to use Affresh® once per week for three weeks for really dirty washers. But we only wash a couple loads per week. So we’ve found that our front loader stays odor free for two or three months between Affresh® uses. As long as we leave its door open between washings, mold and mildew stay away for months on end. These thick plastic bags keep the active ingredients fresh until use. Resembling thick cellophane, they cannot be easily torn open; requiring sharp scissors instead. Do not open the pouches until ready to use them, as doing so might render this product less effective. We bought the five-tablet box for about $10 at Walmart. Cheaper solutions exist too though. These include straight bleach and baking soda. But these may or may not work. True. They may be effective alternatives in some machines. But if you have no time to play around, use Affresh®. If you want a cleaning tablet that does it right the first time, this Affresh® product is just that. Though it costs more than baking soda, Affresh® is worth every penny. You pay roughly two dollars per use. You simply cut open the plastic pouch. Then, drop one Affresh® tablet into the washer tub prior to starting the wash / clean cycle. It does not make much airborne dust. So any eye or nose irritation you might feel is low. Just avoid touching the tablet directly, and keep it away from mouth, nose, and eyes. Not only does Affresh® deodorize, but it helps keep small pipes and openings in the HE washing machine from clogging. Affresh® helps preserve HE performance thus. Highly potent smell stopper, deodorizer. The Affresh® scent left behind strongly hints that the washing machine has definitely cleaned up thoroughly. Also, Affresh® may be safer than bleach for Bosch front loader washers. Why? Some Bosch unit instructions advise against using bleach in them. For these, bleach may harm their internal parts, whereas Affresh® does not. We’ve used Affresh® without damage on washers that warn against chlorine bleach. In fact, this cleaner says that it works better than bleach, and is safer than bleach besides; a win-win. Since this product relies on oxidation to work, its effect has limited duration as the active chemicals oxidize. By the time Affresh® reaches the septic tank, its active agents have gone inert. These include surfactants, oxygen bleach (percarbonate), sodium carbonate, sodium sulfate, and perfume. Whether front loader or top loader, Affresh® cleans. Whether high efficiency or normal efficiency, Affresh® works. Affresh® used regularly keeps most any washer clean and free of offensive stink. Affresh washer cleaner review., 7 ounce box, bottom view. Numerous “home” remedies are effective to deodorize clothes washing machines. But Affresh®, though a bit costlier than these, is more reliably effective in a wide array of washers and situations. While the clean Affresh® scent is at first pleasant, it can get irksome later. It indeed did that in our case, where our work bench was located close to the washer. It remains strong over a day after use in the washer. Suggestion: Tone down the perfume. But if the perfume scent bothers you, run the washer through another regular, hot water cycle. This further rinses out any remaining cleaner from the washer parts. Doing this though, may limit how long it takes for the bad odors to come back. One Affresh® tablet deodorizes and cleans the washer one time. And at roughly $2 per tablet, this cleaner is a decent deal. Now we had lots of mildew and mold before cleaning our HE machines. 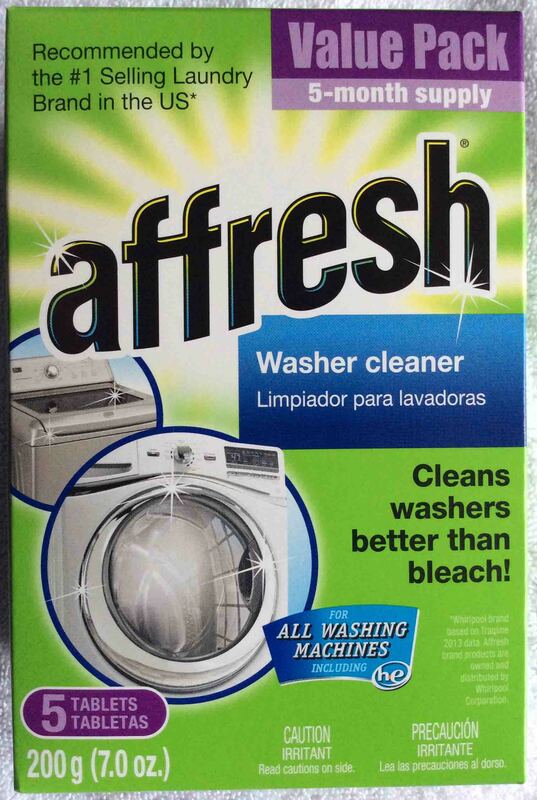 But after cleaning with Affresh®? Very little. So we feel that Affresh® cleaner is a great product. It is an affordable, low effort, long lasting fix for those pesky washing machine stench problems. It solves these fast and effectively. Aside from the possibly strong perfume scent, Affresh washer cleaner works quite well. So we’d rate it at 99 out of 100. 2019-03-25: Added tags and subheadings. 2018-04-11: Revised post content to better target its focus keywords. 2017-01-30: Updated tags list. Added a Related Posts section. Changed post title to: Affresh® Washer Cleaner Tablets Review.